Does auto-expiring security software make sense? The perils of malware and viruses are everywhere, and Mac users shouldn’t be complacent, especially if they’re also running Windows via Boot Camp or other virtualization software. 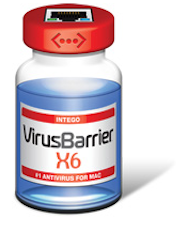 To those ends, Intego has released VirusBarrier X6 Dual Protection, which offers all the features of its X6 product for both Mac and Windows operating systems running on your machine. VirusBarrier X6 DP aims to be a comprehensive solution, defending you from viruses, malware, phishing, and spyware. You also get a two-way firewall (which keeps the baddies out, and your sensitive information in). On the Mac side, you’re protected by VirusBarrier X6, and on the Windows side, there’s Intego’s BitDefender 2010. VirusBarrier X6 Dual Protection is available now. You’ll need an Intel Mac running OS X 10.5 or 10.6 and the software supports Windows 7, Vista, or XP running via Boot Camp, Parallels Desktop, or VMware Fusion. As we reported recently, pricing was a little complicated with Intego’s X6 package, and that’s true for Dual Protection as well. The $60 standard license for X6 DP covers two Macs and one Windows installation. Bear in mind, however, that this price gives you a twelve-month subscription to the virus updates; after that, you’ll have to renew. Intego had not provided pricing information for renewal as of press time. Meanwhile, the $85 family pack will protect five Macs (but still only one Windows installation). A full upgrade from X5 DP to X6 DP—which includes the latest and greatest BitDefender 2010 for Windows—is $55 for the standard license and $80 for the family pack.